(Between the t & a on Stanfree Lane). Tub rail buried on track. Tell-tale red shale, indicative of coal mining. General view of the area. Workings here in 1800 according to Farey's General View of the Agriculture and Minerals of Derbyshire. Vol. 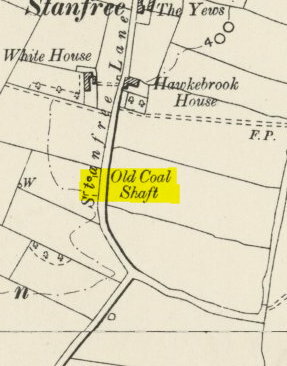 1. p210, Stanfrey or Horsecroft, east of the houses 2.25 miles NNE of Bolsover. Worked under yellow lime, (Limestone). P. 167. The mine could have been worked as a single shaft mine as it is prior to the legislation making this practice illigal. Also working from 1855-1857, owned by a Mr. R. Wright. Must have linked up to another local shaft somewhere. Oxcroft?